Plumber SEO refers to the process of refining digital content for higher Google rankings. Who Should Care About Plumber SEO? Plumbers of all kinds should care about SEO as a marketing tool. Let’s say you run your company in Newark, NJ. 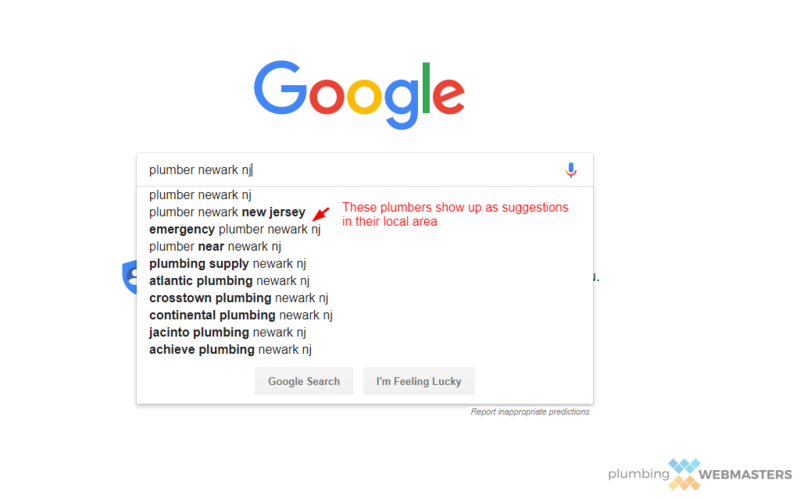 When locals need plumbing services they will go to Google and type in search queries like “plumber in newark” or “newark plumbing repair” and things of that nature. 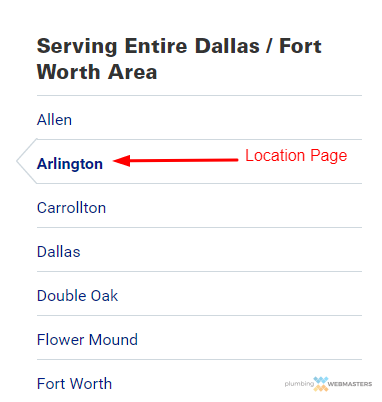 After submitting their search query, they can view a list of organic results as well as local Maps listings. If your company shows up on either organic or Maps for those kinds of keywords, you can expect to generate leads. The more traffic that is driven to your website and the more people who are exposed to your business listing, the more leads you will ultimately generate. Leads don’t always transfer into sales conversions, but there’s measures to take that can increase that probability. One of them is conversion rate optimization, otherwise shortened as CRO. Fort those unaware, CRO can take traffic drawn in through SEO and increase its overall value. The two methods are actually very inter-connected, and having one of them without the other discourages the type of sales growth that plumbers aim for. Driving relevant users to your website or listing is the first step, but converting them is the next one. Ways to improve CRO include improving website design, showcasing clear & convincing calls to action, and increasing loading speeds, especially on mobile. Tricking consumers is less probable than it was prior to the internet. With Google Reviews, Facebook Reviews, and simple ways to gauge the reputation of any plumber, outbound marketing tactics are no longer effective on a larger scale. Think of outbound marketing as old-school and aggressive methods that once lured in plumbing clients. One such example is telemarketing. Before Google, the receiver of the telephone sales pitch could still be sold based on persuasion. Today, if that same prospective customer is typing your name into Google while on the phone and sees a 2.5/5 star review, there’s nothing you can say to convince them to trust your services. Inbound marketing is far more effective, and SEO is the most affordable inbound method. This kind of marketing empowers the consumer to “come to you” and make the decision themselves. All you have to do is facilitate the opportunity. The digital marketing era has given new platforms to businesses of all kinds. Some have taken advantage of these an propelled them into financial success. Others have lacked the dedication to the process and have failed to capitalize in the same manner. Plumbing contractors typically fall into the latter category where their opportunities have not been taken full advantage of. 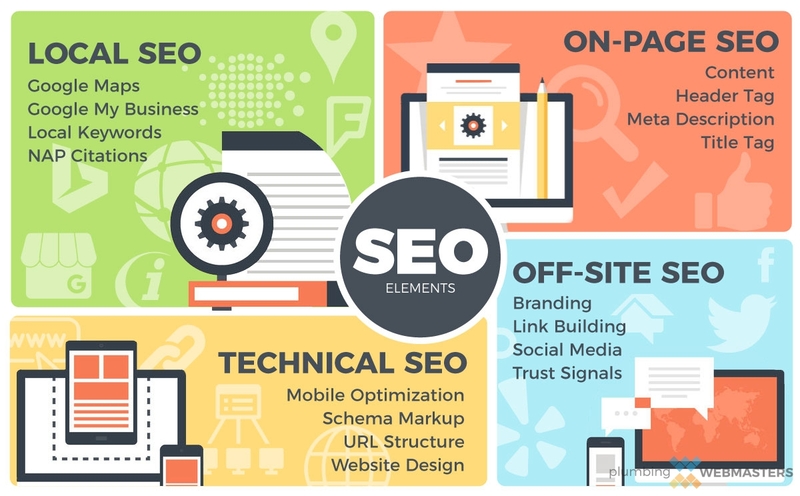 Search Engine Optimization, otherwise shortened as SEO, is the most sustainable digital marketing practice available and one that every successful business utilizes in some manner. As plumbers will attest to, the bottom line goal of marketing of any kind is to generate leads. There’s a multitude of ways to promote plumbing services, including paid advertising and old-school outbound marketing, but neither of them offer the affordability and sustainability of SEO. Because of Google searches and Google Maps listings, there’s no greater source of plumbing leads than the world wide web. Every day access to WiFi enabled smartphones makes the stream of potential leads almost infinite, and every plumber should address this reality in 2019. SEO is not something to make up as you go. Instead, SEO should be planned and strategies using analytical tools, including keyword research. 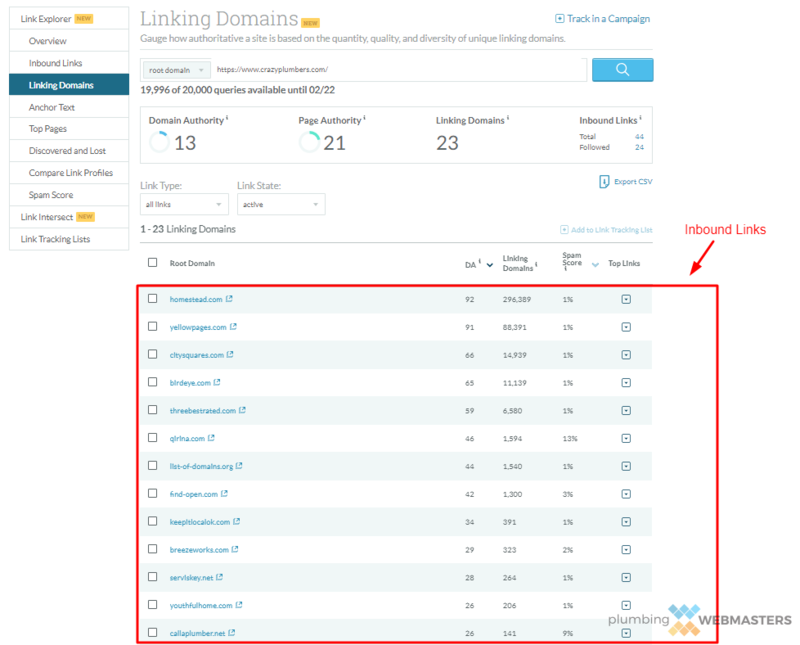 Some of the most popular keyword research tools are MOZ & SEMRush. The goal during SEO planning is to locate high opportunity keywords. The formula for a high opportunity keyword is volume and relevance. Volume is a quantitative metric and represents the amount of times a term is searched per month while relevance is qualitative and generally subjective. 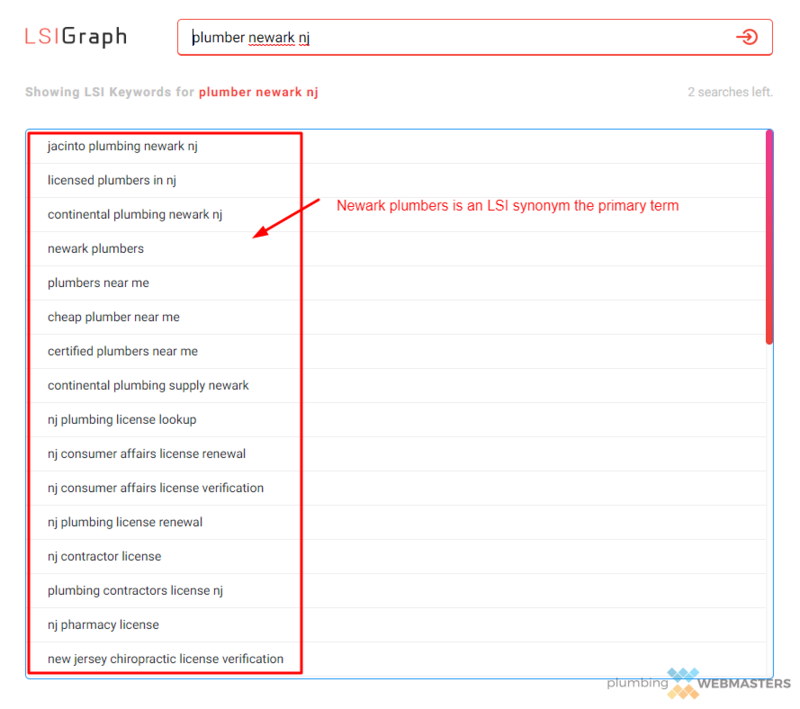 An example of a relevant keyword term for plumbers is “plumbing repair services” while a term like “buy plumbing parts” would lack relevance in most cases. There’s a term associated with keyword research known as commercial intent. This term indicates that the user who performs the search query intends to spend money. For this reason, a query like “diy plumbing repair” would not have commercial intent and ultimately would not be a good target for local plumbing websites. The goal is to drive traffic that can be converted into sales. Individuals looking for information only, are not intending to invest in your services and become “empty” visitors on your website. There’s some indirect value in having people come to your website regardless of reasoning, but it can also backfire if they don’t have their needs met. If they exit your site quickly upon entrance, your bounce rate will increase and ranking will decrease. Keywords can be broken down into groups based on priority and range of influence. For example a term like “plumber in newark” is going to bring in a significant number of people because it is a more general term. A keyword like that, which has high volume and is also highly relevant to your website is going to be considered a primary keyword. These types of keywords should be on your homepage, including its title tag, meta description and even H1 tag. It also helps to link back (internally) to your homepage using anchor text with the primary keyword. 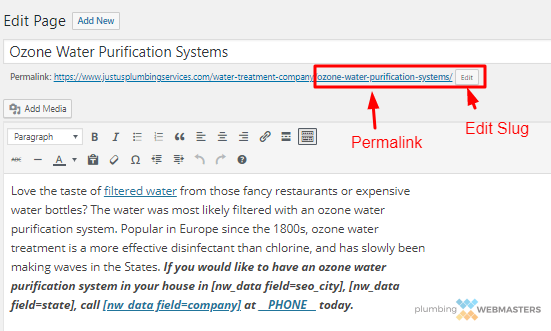 So if you later write a blog post on a more specific plumbing service that gets clicks, you’ll want to make sure to place a link on the bottom to your homepage using the primary keyword anchor text. Your homepage can’t optimize for every single plumbing keyword which is the entire reason why you need a large website with pages for each individual service. Those internal pages will target what are known as secondary keywords. These kinds of terms have less search volume but are more specific. They tend to attract a niche group of people who while are lower in total volume, are highly likely to convert once reaching your site. So for lesser known services like gas leak detection, the traffic won’t be as frequent, but when it does come, it will be very valuable. Keyword research tools are equally as important in identifying secondary keywords as they are for primary terms. Using the website LSIGraph.com, you can gather terms that are related to a primary or secondary term. The concept of LSI keywords is based on the semantic search theory. When groups of semantically related terms are present on a single page, the search algorithm detects a higher level of relevance than a page that uses the same keyword over and over again. Just like synonyms help readability in a general sense, LSI keywords help diversify the language of a page while keeping the general topic interwoven. Since content quality is so important to Google, the implementation of semantic search methodologies have multi-faceted advantages. Choosing keywords informs an eventual URL structures which should be designed as a hierarchy. The top level or parent pages go on the top and they drill down to lower level or child pages. Think of them as branches on a family tree. The homepage starts the hierarchy and it goes down from there. You can drill down pages to as many subsets as you want, but no more than 4 is recommended. A URL like plumber.com/services/toilet-repair is more than enough to organize and display a logical structure that users and search engines alike can interpret. Try to use as few words as possible when creating URL slugs (permalinks) which we will touch on later. As for keywords, they should be the foundation of URL structuring and inform their development. 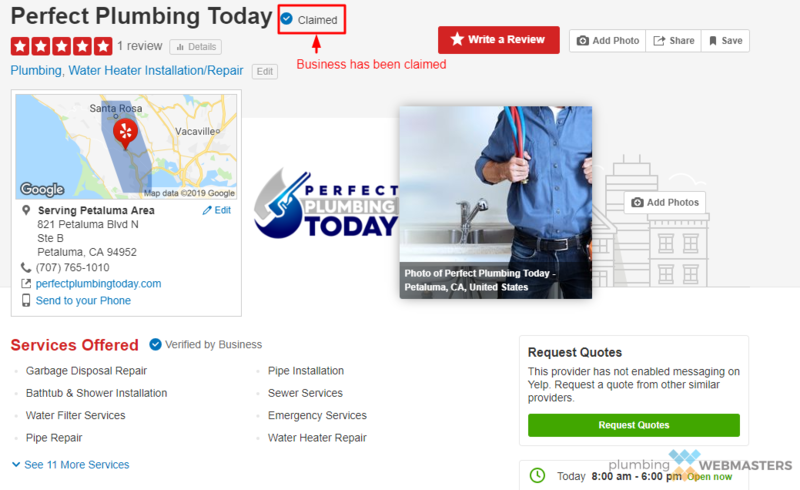 Plumbing websites with original photos convert at a much higher rate, leading to higher ranking and a superior client base. That’s why utilizing images of your team, equipment, and logo are best practice for SEO. Aside from the image quality itself, optimizing photos for web use is also critical. That’s why every file should be renamed with lowercase letters and a topical title. An example of an image file would be plumbing-truck.jpg. This would note an image of your truck which could then be uploaded to your website and featured on the homepage. Once uploaded, the image should be tagged with alt text which describes in short, what the image shows. 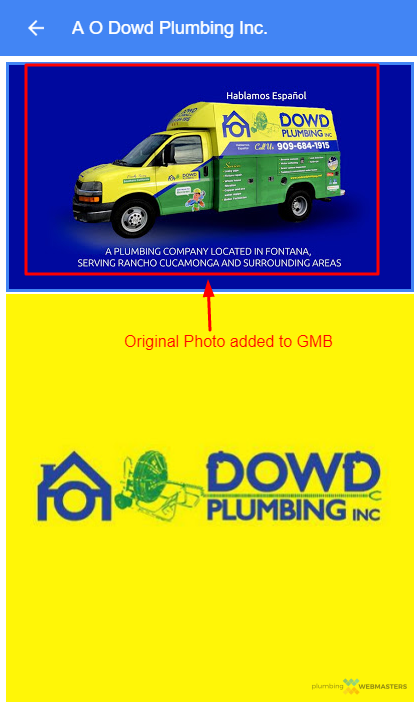 In this case the alt text would be as simple as Company Name Plumbing Truck. After planning comes implementation and SEO is most effectively executed when preceded by a well developed plan. Since the research that went into your plan is trustworthy, you can rest assured that the process of implementation is worth your time and trouble. But make no mistake, executing SEO correctly can be a painstaking process with minor details that can have major implications. The end goal of course is to generate as many leads as possible for your plumbing company. And believe us, there is no more affordable or sustainable method of plumbing lead generation than SEO. That’s why the efforts are worth your time as a contractor. Google’s algorithm changes constantly. In fact, it changes almost every day. That’s why no SEO marketer can ever become too attached to a certain way of doing things. Sure, Google has made it clear that it values ethical or white-hat methods. But within that range of tasks can be a lot of room for variance. Never engage in tactics that seem shady from the get go but always stay attuned to what the latest SEO trends are. Websites like Search Engine Journal can help you stay on top of the latest trends from Google, while the Plumbing Webmasters blog can help you focus on marketing trends within your niche. Most plumbers either have a website or know that they need one. So on that level, they understand the importance of internet marketing. What less of them know is the differences between an SEO-friendly website and one that is simply taking up space or serving as a digital business card that is only seen when someone is specifically instructed to visit the web address. SEO-friendly sites in contrast help consumers find services through organic means, i.e. Google search. With cleaner code, schema markup, and other perks of customized design, websites built by professionals have a greater chance of ranking than DIY website maker templates. Since the goal of all marketing ventures is to create contact, having business contact information prominently displayed is imperative. When a prospective customer clicks through your plumbing website they should notice NAP information on the homepage. NAP for those who don’t know, stands for name, address, phone number. All three pieces of info should be on the footer of your website, while the name and phone number should be shown in several areas throughout each page. NAP info is not only critical to website success, but also to business directory influence, especially as it pertains to Google My Business. The presence of a phone number isn’t enough to make someone call it. They must have incentive and urgency. That’s what a CTA or call to action is for. A CTA in the SEO world refers to an element of a website that encourages the user to take a desired action. In many cases the action encouraged is calling a phone number. Using this example, an effective CTA would be a clickable phone number button that said “Call Now for a Free Phone Consultation.” The incentive of the user is to receive the free consultation and the abruptly take an action as a result. Now you have them in your conversion funnel and can discuss their plumbing issues. If they like how you communicate, it’s more likely than not that they become a customer at some point, if not that very day. CTA’s can also be less direct, and drive consumers towards entry levels of a more drawn out sales funnel. One such example of this would be an email newsletter opt in. While the user isn’t explicitly demonstrating an intent to use your services in the near term, they are consenting to the delivery of your marketing materials which can lead to a later sale. Trust is one of the most important conversion factors, and nothing builds trust like 3rd party endorsements. While inbound links can serve as 3rd party endorsements in the eyes of Google, the user, once on your page, is going to need a more concrete, visual demonstration. Awards and badges make this task rather simplistic. Most institutions encourage websites who receive awards to publish the badge on their website. 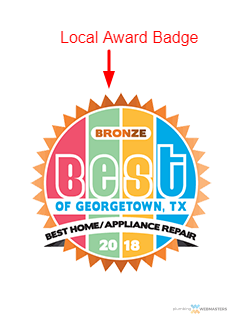 Whether it’s Angie’s List, Better Business Bureau, or HomeAdvisor, badges for plumbers with accreditations and awards are readily available. You can take this process a step further with news publications. If you’ve ever been interviewed by a local newspaper, you can place its logo under an “As Featured In” section of your website. The more reputable companies that associate with your brand, the more customers perceive trust. The user most likely to consume your website will do so on a mobile device. That’s right, over half of all website visitors are on mobile in 2019. Plumbers should be especially aware of this trend, as local searches with commercial intent are often performed through smartphones. Because the goal is to show up both on organic and Maps results for mobile SERPs it is mandatory that your webpage is mobile optimized. What does that really mean? It means clean navigation, an undistorted viewport, and ideally, a clickable call to action that connects the user directly to your office phone line. Speed is also crucial on mobile devices even more so than with desktop. Sites that don’t load within 3 seconds can expect to lose over 60% of their would-be visitors. Google Maps and Google My Business are critical to a plumber’s online success. It is the central hub of every local businesses’ online presence. The two entities are interconnected so when you see star review ratings on Google Maps, they are coming from reviews made to the My Business account. One cannot exist properly, without the other. Plumbers who rank the highest on organic and Maps have consistent contact information listed on both their Google profiles and their main website. The business address within the footer of your primary website should exactly match the one found on Google Maps and Google My Business. This information is verified by Google through postcard so that they can acknowledge the legitimacy of your business. PO boxes and virtual offices are not acceptable for Google. So if you want to be seen as a real business, you must have a legitimate physical address. Local SEO for plumbing companies is responsible for most of their leads. Unless you run a national plumbing company, which is rare, the searchers who come across your information will be targeting a local service. The goal is to appear in both the Local Map Pack as well as the regular organic results for related terms. As you know, Google results are dynamic based on the user’s location. So for example, the search of plumber near me in Oklahoma City will show different results than the same query submitted by a user in Dallas. Google’s goal is to match relevant results with its users and so its most logical to market to prospective plumbing customers within a defined local service area. For these reasons, Google Maps and My Business are non negotiables. Part of local SEO is local business citations. Most major directories offer a free citation to any plumber with a business. Angie’s List and HomeAdvisor are examples of niche directories for plumbers. In contrast, Better Business Bureau and Yep are for all types of businesses, not just home service providers. Still, they help expand your contact info across a diverse digital landscape. You might get offers for premium services from these directories, most of which promise more lead generation for a monthly fee and enhanced profile pages. These are largely unnecessary, as the goal of citations is not to be the lead generator themselves, but to improve local SEO. You might find that some directories have listings of your business that you never manually submitted. They likely got them from data miners like Acxiom who gather your information from public record and then distribute it to these directories. You can address the direct source by ensuring your info on Acxiom is accurate, consistent, and up to date. Speaking of consistency, NAP information is only helpful when uniform. That means that your name, address, and phone number on your plumbing company’s Facebook Business Pages should be identical to the information on your Yelp listing. This includes seemingly minor details like the abbreviation of your address suffix. If you write out Street on one listing, and abbreviate it as St. on another, it can’t have the same impact from a local SEO standpoint. There’s also cases where inconsistency is far more severe and begins to confuse the potential customer. 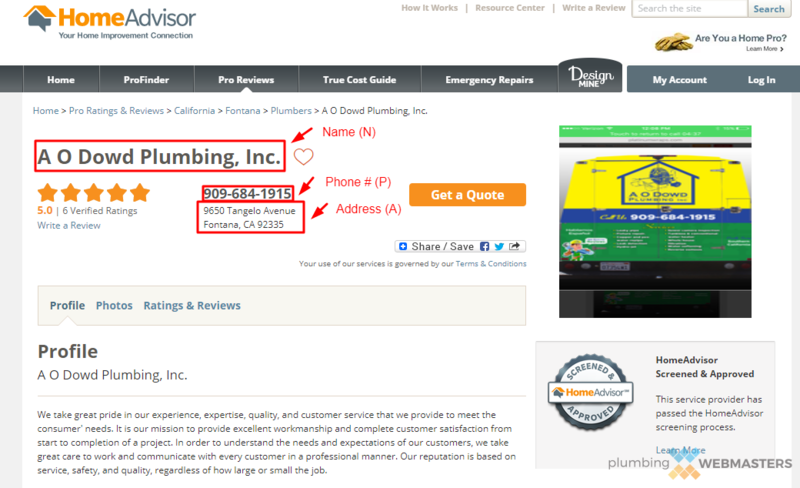 When a company name is written differently on separate platforms, customers may not know if its the same plumber. This type of confusion is something Google prefers to avoid on behalf of its users and will therefore give priority to the companies who demonstrated consistency and uniformity throughout all corners of the world wide web. GMB, better known as Google My Business requires its own level of optimization. Aside from claiming and verifying the listing, GMB profiles can be enhanced through a series of tasks which can increase conversions. One prime example is uploading company photos. When potential customers see the names and faces of your employees along with some of your equipment (trucks, transportation, etc.) they are bound to place more value in your company as a while. Other ways to enhance Google My Business are Google Posts, Question & Answer sections, and a clickable call to action, all of which Google makes available to anyone who chooses to utilize it. Keep in mind that for branded searches (when someone searches your company name), your Google My Business profile should be displayed on the right hand side of the SERP. This is a good barometer of whether or not your plumbing company is properly optimized online. Since plumbers typically have one business address, they are unable to optimize as well as they’d like in nearby cities and towns. Still, these locations within a 45 minute driving distance are worth targeting for leads. But let’s be clear about something, Google will give priority to plumbers who are actually located in the zip code they serve, as determined by their verified Google Maps address. So how do you expand your reach to other cities? One way is through location pages, but be careful, mass producing city pages is not good for SEO. If you choose to make location pages, make them unique and robust and never use spun content. For those unaware, spun content is auto generated writing that is aimed at mass producing content for thousands of pages (in a short period of time). Some agencies use this tactic to try to get plumbers visibility in tons of nearby cities and towns. It does not work. Don’t do it. Reviews are a major factor for local SEO. In fact, according to Bright Local, 86% of consumers read local reviews before making a purchasing decision. With that in mind, plumbers need to generate customer reviews. This can be done by asking for them in person after completing a service. One tool that can help you facilitate more reviews is Righteous Reviews widget from Plumbing Webmasters. This plugin populates reviews of your service from Google and Facebook directly on your website and comes with a Review Us button that helps visitors leave a review on either platform without having to ever leave your site. It also sends text notifications as reminders to customers to leave the review. The added convenience of having this on your main website increases the likelihood of people leaving the feedback. On-page SEO refers to optimization that takes place directly on a page from your primary website. For people with casual knowledge of SEO, on-page SEO is what they think about. It is understood as a way to get your website to rank higher on Google and is closely associated with keywords, meta descriptions, and many of the most discussed tactical actions. How well on-page SEO works is determined by the quality of your planning stage along with the competence of the individuals executing it. Although many of the tasks are fairly simple, they are not always easy and require consistency and attention to detail. If on-page SEO is done properly, its impact will be ongoing and serve as a major business asset for your plumbing company. Securing a top spot on Google SERPs is one of the most gratifying promotional experiences you can ever have. It will translate directly to lead generation in the form of phone calls and email requests, and you won’t be paying any sort of advertising fee to keep it going. Google’s algorithm may shift your rankings around from time to time, which is why it is important to stay on top of the latest algorithm updates and continue to invest in SEO marketing. On-page optimization can be a foundation for other aspects of SEO like off-site, technical, and local. Titles, headers, meta descriptions, paragraph content. These are places where plumbers should place keywords on their website. When Google crawls a page they pick up on keywords which helps define the context of the site and or page. Each page on your website should target a primary keyword which should be placed at least once in each of the areas mentioned. Be careful not to stuff keywords however, as Google will penalize any placements that look unnatural an manipulative. Aside from primary keywords, you also want to input secondary and LSI keywords throughout your content to help diversify the language and improve readability. The SEO title is the most basic way to explain what a webpage is about. Calling your homepage Plumbing Company in Oklahoma City, for example, makes perfect sense for SEO. You want title tags on each page to be simple but clear and to contain the target keyword for the page in question. Avoid using spam-like titles that stuff multiple keywords into the 60 character limit. You can test the length of your title tag, as well as how it will appear on search engines, by using MOZ’s Title Tag Preview Tool. If the preview looks appealing from a consumer’s perspective it will increase click through rate (CTR). Consider adding a sales pitch of sorts after the main keyword. An example would be Plumbing Company in Oklahoma City | 24/7 Services. 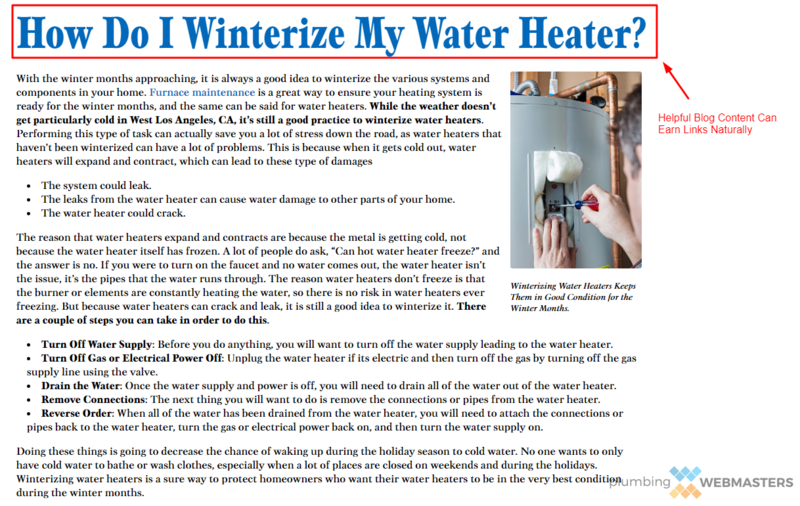 Let’s face it, no user is going to sit down and read pages worth of content on plumbing. Header tags help organize the content so readers can locate the portion of the page that is most urgent to them. Headers like titles are effective ways to execute SEO. There’s multiple variations of headers. H1s have the most SEO equity, if you will, while H2s and H3s are more about formatting and readability. Some websites even have H4s, H5s, and so on, depending on their CSS style sheet. Because of its influence over SEO, the H1 is a good area for keyword placement. Once again we must stress that stuffing keywords is never acceptable, and it should always be executed in a natural and readable manner. 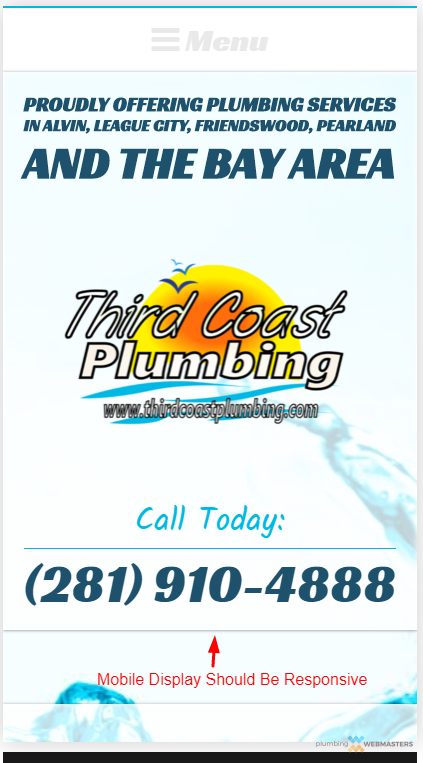 If your title is Plumbing Company in Van Nuys, CA | 24/7 Services. Your H1 might be Plumber in Van Nuys, CA. A meta description is a short summary of what a page is about. It’s longer than a title and a place to expand upon the page’s context. There is no mandatory character limit for a meta description, but the recommended length for optimal display is between 50-300 characters. As is the case with other areas, meta descriptions are great for keyword placement. Try placing your primary term towards the beginning of the description and perhaps a secondary or LSI keyword in the middle. Another option of meta descriptions are call to actions. Try placing your office phone number in the description itself and encourage those who see the result to contact you ASAP. When you visit a website an look at the address, you’ll notice the last part of the URL defines the page you are on. 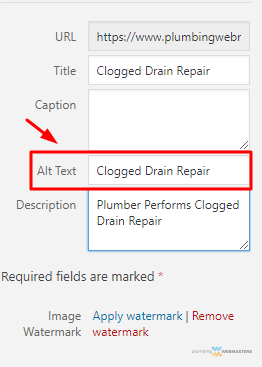 In other words, plumbingcompany.com/clogged-drain-reapir demonstrates that you are on the clogged drain repair page within the plumbingcompany.com website. The last part of the URL is called the permalink or sometimes the slug. It can and should be edited before publishing a page. Permalinks are great for keyword placement especially if the term is short and concise. Google can more easily crawl shorter URLs and so the less characters, the better. A URL slug should generally match the title tag. It doesn’t have to be identical, but it should be on topic. There’s one more section to place a keyword in, and it deserves its own write up on this guide. That section is the image alt text on image files. This requires a bit of context. We spoke about the importance of images earlier in the guide. They should always be topical and relevant to the written content on the pages and ideally should be unique and original. Let’s say your page for clogged drain repair shows one of your employees performing this very service on a previous job. In this case, you’ll want to upload the image file as clogged-drain-repair.jpg and then write out the alt text as something like “Employee Performs Clogged Drain Repair in Oklahoma City” or wherever you are located. Now you have the keyword within the image alt text and it perfectly describes the image. A win-win SEO task for plumbers across the country. On-page SEO is something even people with basic marketing knowledge can grasp. Off-site SEO is not as commonly understood by the masses. Off-site SEO refers to optimization that happens off of a primary website. It involves social media, link building, and external branding. Sometimes off-site factors can have direct influence over page ranking (inbound links) while sometimes their impact is indirect (branding). And then there’s the factors that we don’t know for sure about. One of those is social media signals. MOZ and others have found them to be at least somewhat of a local ranking factor but others vehemently declare that they have no impact. What we do know however is that they do impact brand and search visibility in other ways making them an off-site SEO factor, regardless of how much they influence page rank. Link building is really the foundation of off-site SEO, which some may refer to as off-page SEO. There’s many ways to build links, some legitimate, some manipulative. One thing is for certain however, links still matter. If you’ve heard of metrics like Domain Authority from MOZ, then you might have a concept of what links do for SEO. The idea is that inbound links from authoritative websites service as votes of confidence. They are the SEO version of a political endorsement. If Google finds out that a national plumbing parts supplier endorses your company with a link to its main website, they take that under consideration when establishing its ranking position. There’s ways to build links and ways to earn links, and we’ll discuss both in the following section. Facebook, Instagram, LinkedIn, Twitter, YouTube. Keep those 5 platforms in mind when developing a social media presence. Each of them offer plumbers the chance to create a free business profile. These are very popular social channels and at the very least, serve as another web entity on which your business can brand itself. At the most, the become sources of lead generation themselves and influence the ranking of your company’s website and Google Maps profile. Facebook in particular is very important for plumbers. Not only is it a social media network but it is also a local business directory. Like with GMB, Facebook shows a rating for businesses in the area, so plumbers should pursue reviews on Facebook as well as Google. Building links can be a grind for plumbers. Some of the best places to start are with free profiles, including social media. Your Facebook Business Page for example can serve as an inbound link from Facebook to you. It can also be a place to share blog posts which then create further inbound links. Keep in mind however that links from social media profiles are considered NoFollow. What this means is that Google tags them as less valuable from a link equity standpoint. This is done because Facebook itself is not endorsing your website, it is you who are manually creating the link. Because of this, anyone can do it, and it matters less than a real endorsement. Despite this, these links can still help grow your brand and authority, just not as much. Business directories are also NoFollow links. Other ways to build links include guest blogging, and email requests. If you build inbound links in these ways, the links will be considered Follow and hold more link equity. Google prefers that links are built organically, which essentially means they are earned rather than arranged. The best way to earn links is to write great blog posts and share them on social media. The hope is that another website will see them naturally and link back to the page. Writing great blog posts can also help you rank high on Google for certain keywords. The top results for any given term are the most likely to be linked naturally, usually as a reference in another blog post. This manner of link formation is something Google hopes to facilitate as it is the antithesis of old school linking tactics that were mostly arrangements and seldom indicative of legitimate association. The algorithm has gotten more advanced and can now more effectively determine the relevance of a link. Plumbers should proceed accordingly. Having been in business for the better part of a decade, Plumbing Webmasters serves hundreds of clients. Through our use of in-house client communication software, dedicated customer service reps, and a team of 20 Webmasters, we are able to provide a one stop shop to local plumbers who are looking to market their services online. 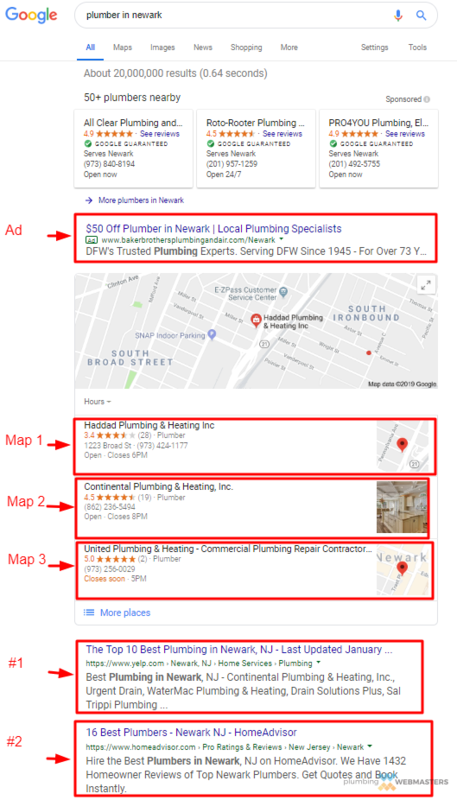 Since our expertise is the plumbing industry, we know what it takes to rank plumbers on top of Google, for both Maps and traditional organic results in 2019. 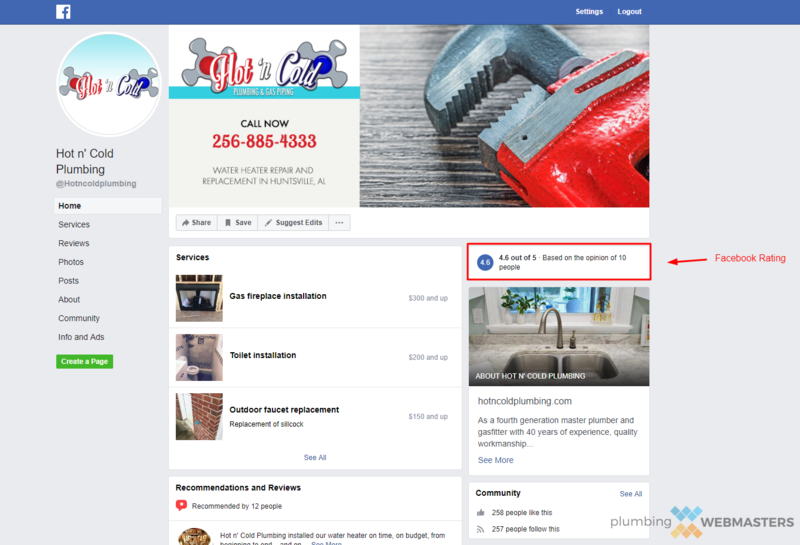 There’s plenty of digital marketing firms offering services, but how many of them specialize in the plumbing industry? There might even be some that offer plumbing & HVAC SEO services, but what about those designed specifically for plumbers? 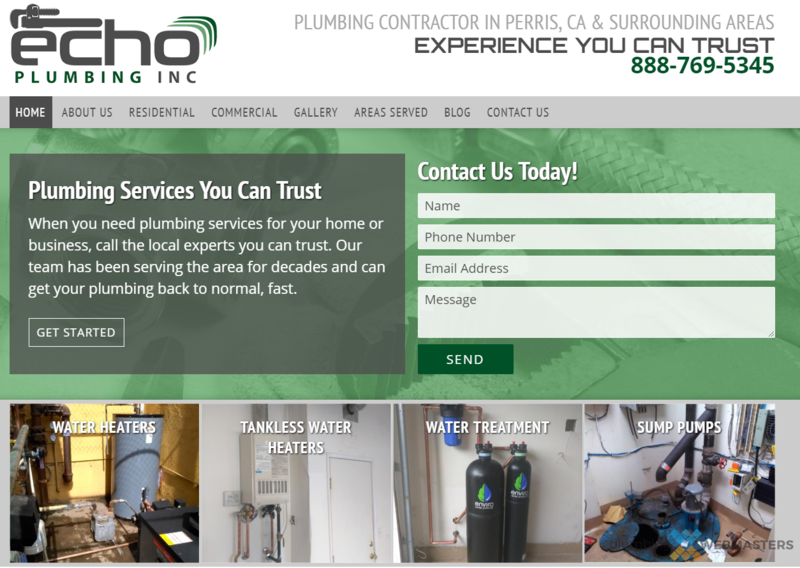 We pride ourselves on being the most trusted plumbing SEO company in the United States. Talk to our clients, they continue to be impressed by our dedication to their campaigns, and the evolution of our services as Google evolves themselves. We are not set in our ways because the only way to keep clients at the top is to continue to progress and take notice of industry trends. As a local plumbing company, you don’t have the time to do this yourself and you need someone trustworthy to do it on your behalf. We are here to tell you that Plumbing Webmasters is the SEO service for you. We will design a custom website, optimize it for search, and continue to work on it throughout the duration of our relationship. Call (877) 388-9884 now to learn more.